In one of my previous posts, I have shared my experience during my Zumba class at JNA Dance Center. On that particular post, I have mentioned that I fainted while dancing because I have a low blood pressure condition. After that incident, I decided that I must consult my doctor for some medications and other necessary medical advice. During my visit to the doctor, he gave me some medications to take for me to improve my blood circulation.He also gave me some medical reminders on what or not to do to avoid that incident (which happened during my Zumba Class) to happen again. 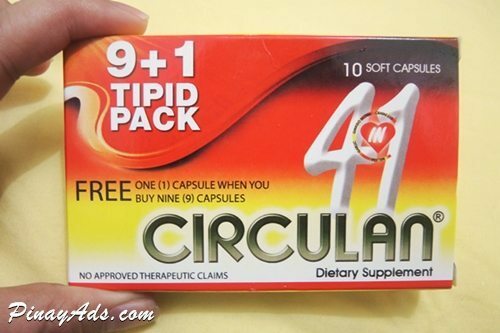 Before I left, I asked my doctor if it is okay if I can take additional supplements, like the Circulan. And addition to the medicines that he already prescribed, fortunately, he gave me a “go signal” to add that Circulan because it is also helpful in promoting good blood circulation. To make the long story short, I bought some capsules of Circulan and I have been taking it for a week already. 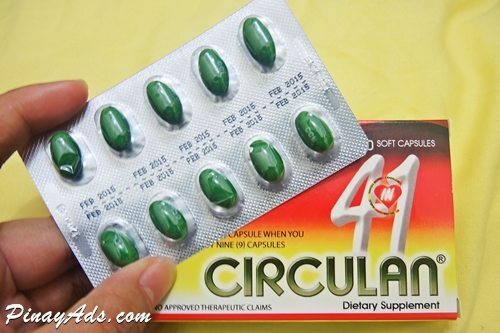 I am not sure if Circulan has already an effect on my well-being but lately, I noticed that I can easily doze off at night and that I really feel the vigor every morning when I wake up, which I haven’t experienced before taking Circulan. My husband even noticed it and started to tease me that I am becoming more “blooming” every day, which I am very much flattered. Anyway, I like the effects of Circulan to me and I will definitely continue taking it. I am also hoping that it can help me with my hormonal imbalance. Circulan is a soft gel natural food supplement capsule that contains four potent herbal extracts that have been scientifically proven to work synergistically. This is for the stimulation of proper blood circulation. Hawthorn (50 mg) – “Cardiotonic herbal supplement” to help the pumping action of the heart thus improving myocardial circulation. Ginkgo Biloba (5 mg) – Increases blood flow and oxygen to the heart. Garlic oil extract (150 mg) – Has an anti-fungal, anti-bacterial, anti-platelet aggregation and has lipid lowering actions. Lemon balm (10 mg) – Helps to relax the smooth muscles and provides a calming effect. It has also anti-spasmodic activity. Pain in the calf muscle, leg cramps, menstrual cramps. It is available nationwide for a price range of Php15.00 – 16.50/capsule. Circulan is safe even for pregnant women. For safety reasons, I suggest you see your doctor first before starting your daily Circulan intake to avoid necessary effects.